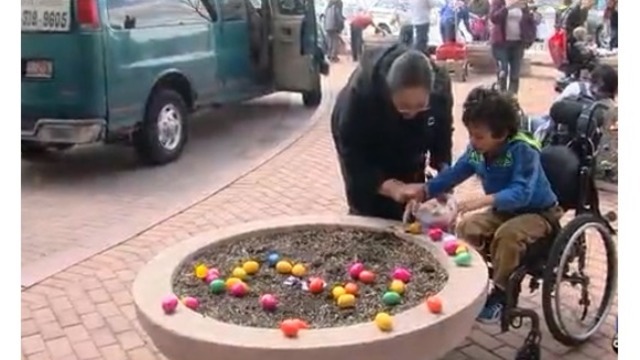 The egg hunt will be held Friday from 1 p.m. to 3 p.m.
SALT LAKE CITY, Utah (ABC4 News) - Shriner's Hospitals for Children in Salt Lake City is hosting an Easter egg hunt for 100 patients and their families this Friday. The annual Spring Fest celebration will feature an egg hunt that is adapted for children of all abilities. The event will be celebrated with children from the hospital’s in-patient unit who won’t be home for Easter. Some of the children participating in the event are those living with osteogenesis imperfecta (brittle bone disease) who rely on this hunt’s increased safety precautions, and children undergoing Halo traction or who are using wheelchairs, easily accessing eggs on tables covered in artificial grass. Staff from Shriners Hospital, including a recreational therapists and care providers from the hospital’s Osteogenesis Imperfecta Clinic, along with volunteers from eight Wasatch Front Super Target stores will all be in attendance. This event allows children the time, space, and support they need to enjoy this springtime tradition. Patients will also enjoy a petting zoo with baby farm animals, face painting and the chance to socialize with peers facing similar physical challenges. The event is scheduled from 1 p.m. to 3 p.m. at Shriners Hospitals for Children located at 1275 E. Fairfax Road in Salt Lake City. The hunt will happen rain or shine as weather will only determine whether the event is outdoors or indoors. Shriners Hospitals for Children — Salt Lake City is changing lives every day through state-of-the-art pediatric orthopedic care for a wide range of diseases and disorders of the bones, muscles and joints. Services include inpatient and outpatient surgery; physical, occupational and speech therapy; custom wheelchairs; orthotics and prosthetics; outpatient clinics; low radiation imaging and a motion analysis center. All insurances accepted and care is provided regardless of a patient’s ability to pay. Learn more at www.shrinersSLC.org.